Made of high quality plastics, each XL Pro price gun is designed to have a long life. They're compact, lightweight and easy to operate. They're great pricing guns for users with various types of labeling to do. 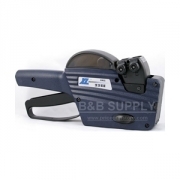 An XL-Pro price gun is designed with a back end label loading feature and a standard band selector, called the dial knob, to make your inventory pricing and coding fast and efficient. The labels are protected by the plastic side plates of the gun, making it possible for this tool to be a viable option for operations that have dust in the air. There is an XL Pro gun option for just about any application. Do you need a long line of both letters and numbers? This line will have something that will work. How about if you need to print two lines to identify three parts of information that each has four characters? An XL-Pro will do the trick. There are a lot of different model numbers that are offered by this brand, therefore, using our system we've set up online to help guide you through, should help you get to the correct labeler for your needs. The XL-Pro price gun comes in one-line, two-line, and three-line models. One line models include the 22, 26, and 37 Series, along with the 18, 19, and 21B. The two-line guns include the 22, 25, 29, and 37 Series. Finally, the three-line options are the 29 and 37 Series. These numbers refer to the size of the label that is used in each gun of that series. An example would be that a tool in the 25 series, such as the XL-Pro 25EEA, would use a label that measures 25mm x 16mm.